It frequently occurs that more warp threads are wound on the warp beam of a weaving machine than are required to weave the intended fabric. This surplus of warp threads on the warp beam is often intentional in order to ensure that there are enough warp threads available for the fabric. To prevent surplus warp yarn getting entangled with regular warp yarns it is necessary to draw off the yarn from the warp beam. The stand-alone warp take-up makes it possible to draw off and wind up single threads or thread bundles consistently on a take-up reel. The draw-off tension of the threads or thread bundles can be set steplessly. 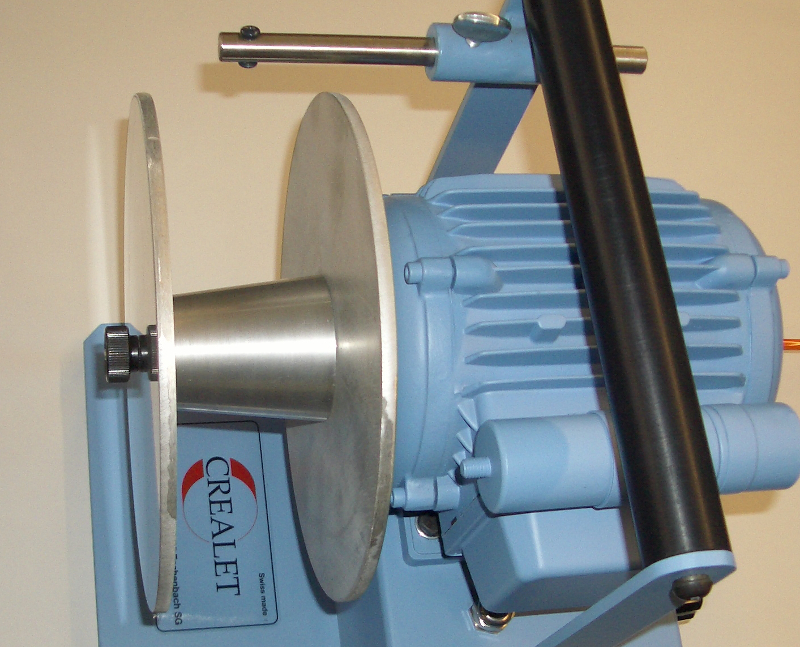 In the case of a full take-up reel, the material can be easily stripped off the cone by removing the front disk. During the standstill of the production machine for fault elimination or similar purposes, it is not necessary to disconnect the winding device. Only during longer standstills, e.g. overnight, is this disconnection advisable. A control light shows whether the device is connected or disconnected. This portable warp take-up can be placed behind each narrow and wide weaving machine. — Winding speed 0-70 m/min.